Each year, we put a call out across the archipelago to emerging writers: send us your stories. After receiving hundreds of submissions, an independent curatorial board is tasked with selecting aspiring novelists and poets from across Indonesia’s bustling cities and remote islands. 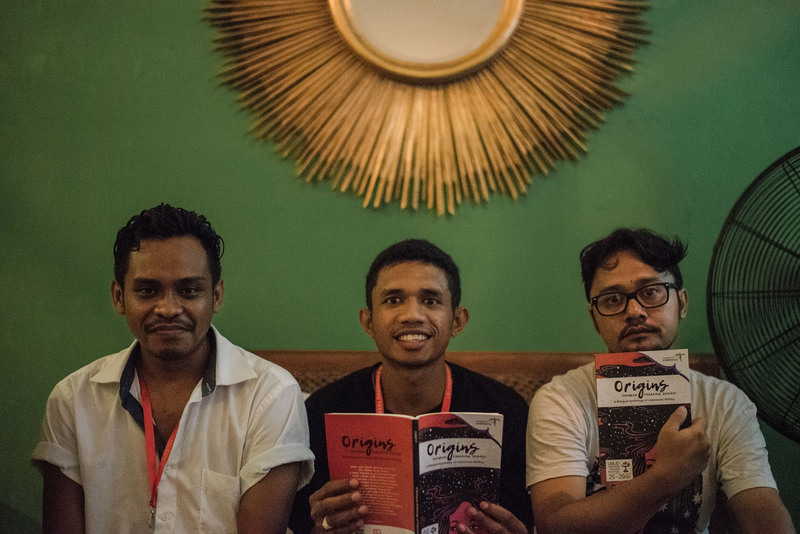 Once selected, the emerging writers are then supported by the Yayasan Mudra Swari Saraswati and the Indonesian Writers Patrons to fly to Bali and launch the annual Anthology in front of Indonesian and international audiences at the Ubud Writers & Readers Festival. A bilingual publication, the Anthology also represents a huge opportunity for emerging writers to have their work translated into English, opening the door to international opportunities for the first time. In an ongoing partnership with the Emerging Writers’ Festival, one of these writers is further selected to present at this dynamic showcase of Australia’s rising stars, and flown to Melbourne to take part in the program. The Festival’s Emerging Writers Program is only possible with the generous support of our Indonesian Writers Patrons. These individuals and businesses assist with airfares, accommodation and honorarium for an Indonesian writer over the course of the Festival. By supporting the Indonesian Writers Patron Program, Indonesia’s brave voices, both emerging and established, will continue to be heard. For all the details about our 2018 Indonesian Writers Patron Program, please refer to this document or read online below. To become part of the Indonesian Writers Patron Program by supporting one of the writers above, please get in touch with our Partnership Manager Saraswati Ratnanggana by emailing saras@yayasansaraswati.org.